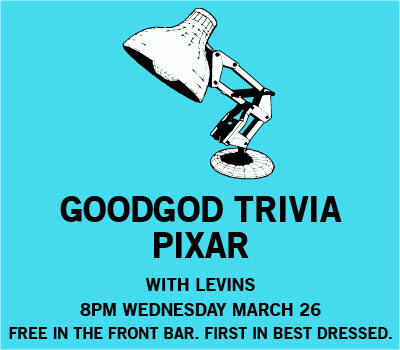 Get out the blu-rays and have a film binge, we’re spending a night with the most unstoppable run of animated films in history as Levins hosts PIXAR TRIVIA! With a run that includes Toy Story, Monsters Inc, The Incredibles, Wall-E, Up and so many more, it’s gonna get competitive across three rounds, bonus challenges and more! First questions from 8pm, grab a crew and get in early for prime position! Free entry.